A procession of Pitt community members dressed in black marched from from Trees Hall to the Bigelow Lawn Wednesday night. The mourning colors were worn not just to remember one death, but millions. Pitt’s historically Jewish fraternity, Alpha Epsilon Pi, held its second annual Walk to Remember with B’nai B’rith International, a Jewish service organization, to honor those who died in the Holocaust and take a stand against rising anti-Semitism. About 40 members of AEPi and the local community walked in silence Wednesday, followed by a 24-hour commemoration outside the William Pitt Union. AEPi members and anyone else who wanted to volunteer took turns reading the names of Holocaust victims and their places of origin and death from 6 p.m. Wednesday until 6 p.m. Thursday. The event occured in conjunction with Yom Hazikaron laShoah ve-laG’vurah — colloquially known as Yom HaShoah or Holocaust Remembrance Day — which is held annually and lasted from sunset Wednesday to nightfall Thursday. Gabriel Kaufman, a junior majoring in finance and marketing and member of AEPi, said the event is important not not only to the local Jewish community but to people of all faiths at Pitt. Kaufman was one of the readers at the event and vice president of the planning committee for it. As the years since the Holocaust increase, younger generations are forgetting about the significance of the atrocity and its lasting impacts more and more. A recent study by the Conference on Jewish Material Claims Against Germany found that two-thirds of American millennials cannot identify Auschwitz — the largest Nazi concentration camp during the Holocaust. Kaufman reinforced the relevance of remembrance today, even 73 years after the Holocaust. He said the march and name reading is to protest and bring awareness to anti-Semitism and to recognize the impact the Holocaust had on his and his fraternity brothers’ families. 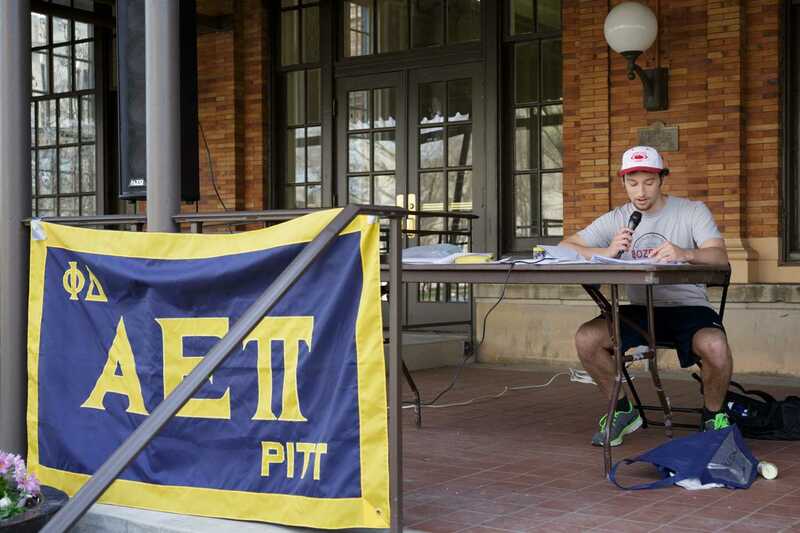 According to Aaron Chumsky, a sophomore math and economics major and the Jewish identity chair of AEPi, the frat began working on the event after Winter Break, planning dates and times and reaching out to organizations such as the Pitt police. “I think it’s important that we celebrate our Jewish identity and that does involve honoring the many who perished during the Holocaust. And also showing that we stand against actions like that and actions of discrimination that are still going on today,” he said. The gravity of the event and the meaning behind it was not lost on attendees and bystanders, such as Ryan Gill. “I was only here for maybe a half hour or so, but he was reading the list and it hit me hard. How many people really died and were killed,” he said. While Holocaust Remembrance Day only comes once a year, organizers such as Kaufman hope that people take away some of the lessons from the event and think about the effect that it had on Jewish people everywhere.